Heras UK Fencing Systems in Doncaster bought a pedestrian tow truck from Yale in 1956 and still Purchasing Manager, Heras UK use it every day to transport loads of up to two tonnes around the factory. This truck has now been entered into Yale’s search for the oldest truck still in operation today. 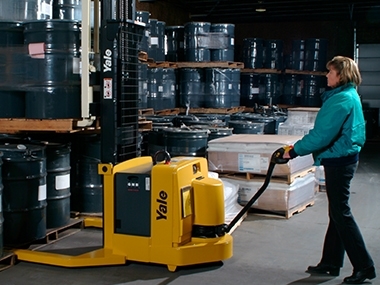 To replace the existing fleet of Yale counterbalance trucks at the Bellshill site to meet the increased demand for its matured whiskies and premium brand spirits, which are bottled and shipped to over 180 countries worldwide at the rate of over 15000 pallets a month, all handled and stored prior to shipment using LPG powered forklift trucks. The 120,000 square foot distribution centre houses 8,000 pallet locations with over 7,500 SKUs in stock ranging from small door rim cylinders to large UPVC multi point locks that are over 6 foot in length when packaged. Mark Beresford, General Manager at Assa Abloy’s national distribution centre in Wolverhampton, UK said: “With such a vast product range comes many different materials handling needs. It was essential that we had a range of equipment that could cater for the different sizes of packages and pallets we distribute. With racking reaching heights of over 13 metres and aisles of just 1.65 metres, BASF has a very specific materials handling equipment requirement for its raw materials and finished products warehouse, where there are over 25,000 pallet movements every week. 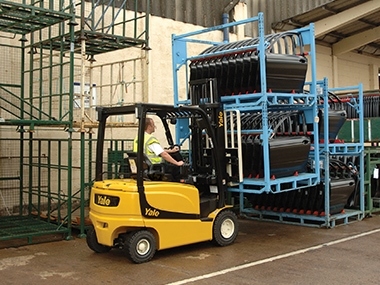 Seven state-of-the-art Yale MTC series VNA trucks operate using a computerised order picking system that automatically determines the most time and energy efficient route through the racking. Established as a RO/RO freight forwarding/logistics company to The Channel Islands for over 60 years, Condor operates freight forwarding services from its Portsmouth, West Midlands, Jersey and Guernsey Freight terminals. The company has a comprehensive fleet of ambient and temperature controlled, specialised and purpose built trailers and vehicles for distribution services to the Channel Islands. 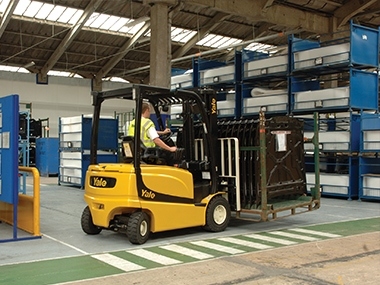 An order picking solution for Kammac’s 330,000 square foot warehouse at Knowsley near Liverpool, with 22,000 pallet locations in conventional adjustable pallet racking, to cater for an average of 10,000 pallet movements per 5 day week, involving 70 trailer movements every 24 hours, working 3 shifts. 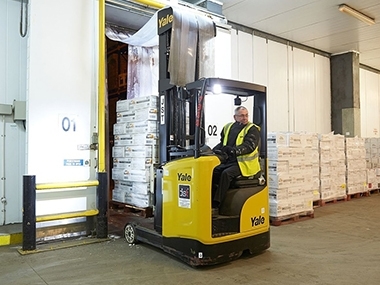 Kammac undertook a thorough examination of leading fork lift truck manufacturers before taking the decision to appoint Yale as its provider for a six year contract. The large site at Stalybridge near to Manchester required forklift trucks to transport product from the storage silos to the warehouse and then onto trailers or into containers for shipment. The granular product is packed into polythene sacks or loaded into eight sided ‘Octabins’ and is then palletised for ease of handling. Unit loads vary in weight from 1000 to 1375 Kg and are up to 2000mm high. 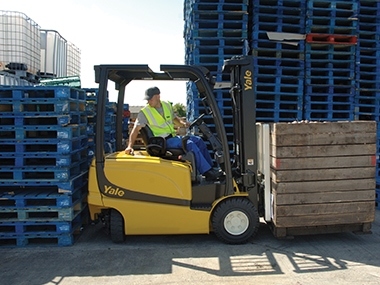 Loaded lift trucks often travel in reverse and good visibility with ease of operation and a high standard of safety was an important factor in the specification for the new forklift fleet. ElectroMech-Yale is an identity formed by an agreement between ElectroMech and Hyster Yale® for the sales and service of the Yale and UTILEV® brand of forklifts and lift trucks in India. Download this Catalogue to know more about the products.